Generated using BRIAN, Steve Albin's database program for the creation of discographies. 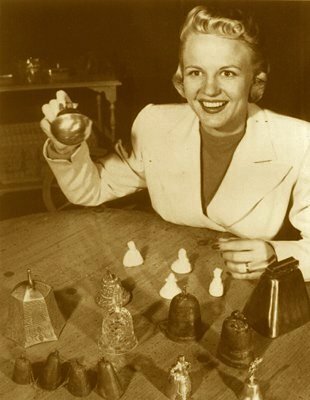 Peggy Lee plays with the puppets from the first edition of the George Pal movie tom thumb, for which she composed various numbers. Another children's film for which she famously wrote lyrics (and did the voices of 4 characters) was Walt Disney's classic Lady And The Tramp. Lee also received an Oscar nomination, as well as awards from critics and movie audiences, for her dramatic role in Jack Webb's prohibition-era film Pete Kelly's Blues. 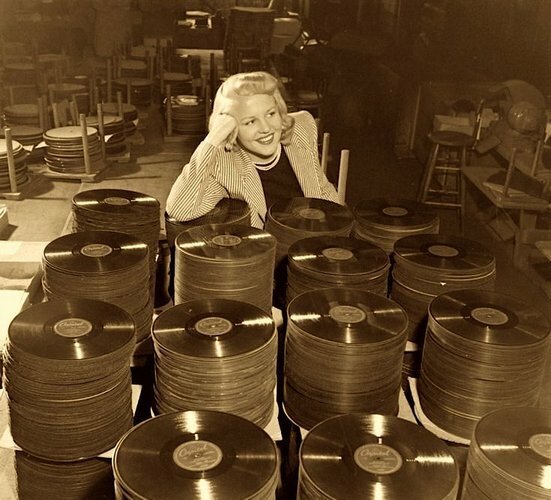 Peggy Lee poses next to a pressing of one of her many hits for Capitol Records. Under contract for 23 years, she ranks as the female artist who was signed to Capitol the longest. During six decades of professional singing, Lee recorded well over one thousand masters and performed frequently in concert, on radio and on television. She also wrote nearly 300 songs, of which dozens were recorded by other artists and a fair number became hits for her. Among her many other honors are 12 Grammy nominations (plus a Lifetime Achievement Award) and an induction in the Songwriters' Hall of Fame. 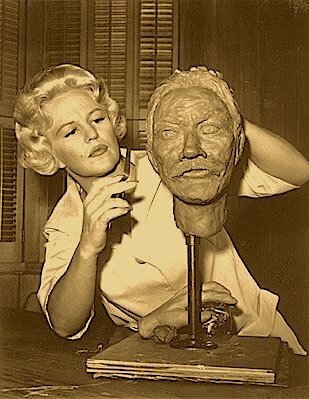 Peggy Lee sculpts the hands and face of Nobel Peace Prize winner Albert Schweitzer, whom she counted among the men she most admired. (Others: Buddha, Jesus, Einstein ... and Cary Grant.) Lee dabbled in various visual arts (most notably, oil painting), published poetry, and even wrote greeting cards. Her business ventures included a music publishing firm and a TV/film production unit.